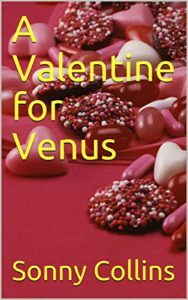 Sonny Collins announces that his novelette, A Valentine for Venus, is now available as a Kindle book at Amazon. A romantic and fun little novelette about what happens when Venus and Cupid bet on who can make someone fall in love first. To make it fair, their grandfather, Zeus, decides to forbid them the use of magic and then goes a step farther by sending them both to Earth as neighbors to a teenage girl and her widowed father – who are also his chosen mortals for this little experiment. They each have two weeks to help their subject fall in love by midnight on Valentine’s Day. Of course things get a bit complicated when Venus realizes her mortal might be falling for her instead of the woman she has chosen for him. Cupid, on the other hand, seems to have the entire high school under his influence. Or does he? This entry was posted in Blog and tagged Amazon and Kindle books, Member news, romance, sonny collins. Bookmark the permalink.